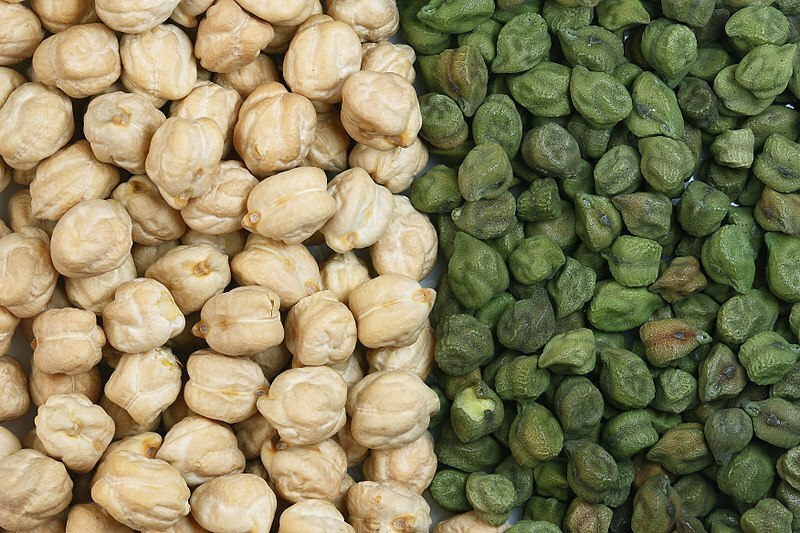 The difference between chickpeas and garbanzo beans is that the chickpea is the English name whereas the garbanzo bean is the Spanish name for the legume, Cicer arietinum. Chickpeas or garbanzo beans are rich in protein. They belong to the family Fabaceae. Furthermore, other names for chickpeas and garbanzos are Egyptian peas, Ceci beans, Bengal gram, and, gram. Chickpeas are one of the earliest cultivated legumes. They belong to the family Fabaceae. 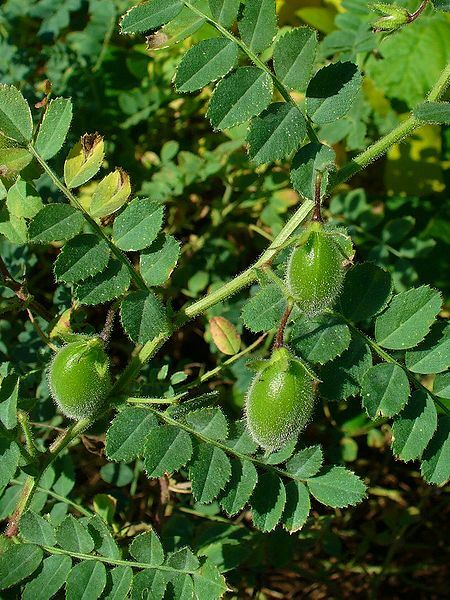 The chickpea plant grows up to 20-50 cm in height and contains small, feathery leaves. The flowers of chickpeas are white in color with violet, blue or pink color veins. Since it is a type of pulse, one seed pod of chickpeas may contain two or three peas. The two varieties of chickpeas are Kabuli, which is light tan and large, and Desi, which has various colors. The colors of Desi can be either black, dark brown, tan, beige or speckled. Around 75% of the world chickpea production is Desi. Chickpeas are a food with a high nutritional value. They contain a higher amount of proteins, dietary fiber, folate, iron, and phosphorus. They are also rich in thiamin, vitamin B6, magnesium, and zinc. The protein content of the cooked or germinated chickpeas consists of essential amino acids including lysine, tryptophan, isoleucine, and aromatic amino acids. Chickpeas are the key ingredient in hummus and chana masala. They are important in Indian and Middle Eastern cuisines as well. In addition, ground chickpeas flour is used to make falafel. Chickpeas can also be used for salads and soups. ‘Garbanzo beans’ is another name for chickpeas that comes from Spanish. It derives from the Old Spanish “garroba” or “algarroba,” and from the Old Spanish “arvanço.” and was first used in the 17th century. Therefore, chickpeas often refer to garbanzo beans in the areas with a Strong Spanish or Mexican influence. On the other hand, ‘cicer’ used to be the term for chickpeas. Later, this term has modernized into ‘pois chiche’ with the influence of French. However, once the English got hold of them, they generalized the above term to ‘chich-pease’, which is easier than the former. Eventually, it became chickpeas. Chickpeas and garbanzo beans are two terms used to describe the legume Cicer arietinum, which bears pods containing pea-like seeds. There is no real difference between Chickpeas and Garbanzo Beans. The only difference between Chickpeas and Garbanzo Beans is that the term ‘chickpeas’ has an English origin while the term ‘garbanzo beans’ has a Spanish origin. Chickpeas are the seeds of the legume, Cicer arietinum. They are one of the earliest crops to be cultivated. Chickpeas are rich in proteins. Though the term ‘chickpea’ originates from English, ‘garbanzo beans’, which is another term for chickpeas originates from Spanish. Therefore, the man difference between chickpeas and garbanzo beans is the origin of the term.